One Fish, Full of Flavours of Mauritius. Well, why not quench our desires in indulging ourselves in food that takes us back to the tropical island of Mauritius – bring on the fragrance of the tropics, the colours of the blue ocean, the feeling of eating under the “filao” trees with our feet digging into the white sand. This is exactly what I do that reminds me of the glorious weather even in the gloomy days. Why not bring the flavours of spicy, aromatic grilled fish to your table this winter. Just like Mauritius with its incredibly rich and diverse food culture, here I wish to share with you the spicy flavours of the ocean in my Aromatic Fried Fish. The seasoning I have used is perfect with all kinds of meat, but teamed with some lovely fish and rosemary it’s a real showstopper. 2 sprigs of rosemary, (finely chop one sprig of rosemary for the seasoning mixture and set aside the other sprig for garnish). 3 Tbs rapeseed oil or vegetable oil. In a bowl combine all the above ingredients (except the rapeseed oil, 1 sprig of rosemary and the vinaigrette ingredients). Rub the fish thoroughly with the seasoning mixture, olive oil and season with sea salt and pepper. Leave the fish to marinate in the fridge for at least half an hour. After half an hour remove the fish from the fridge. Place your frying pan on a high heat with. When the pan is nicely heated add the rapeseed oil. As the oil start to heat, place the fish on the pan, taking precaution you do not burn yourself. Using a long spoon, keep basting the fish all around the surface of the skin and in the inside cavity. By basting with the hot oil, the spices marinade will not burn it will only crisp up the fish skin. Leaving an aromatic spicy crispy skin all over with a soft and moist fish inside. 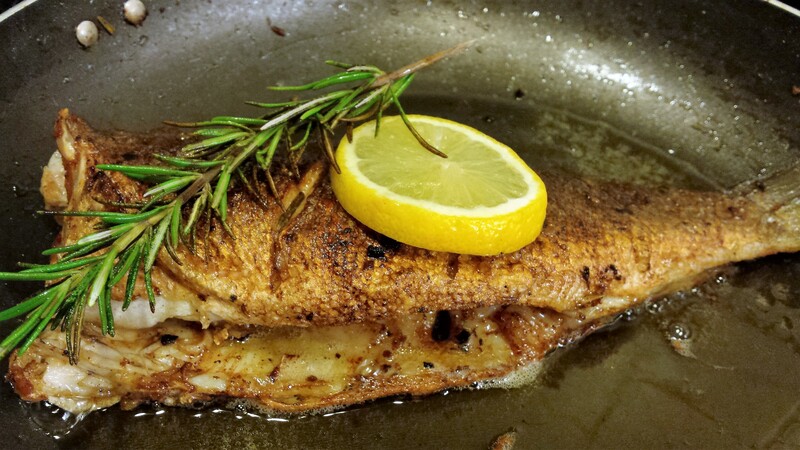 Gently fry on fairly high heat on both sides, rotating the fish as it cooks – so it has crispy skin all over. Turning up the heat on a high guarantees a perfectly cooked dish; crispy skin and flaky fish. Once thoroughly and evenly fried, turn the heat off, add the sprig of rosemary to the hot oil, coating it all over with the hot oil. Remove from the frying pan and set aside on warm serving dish. Be careful when lifting the fish away from the pan to ensure it holds together well. You may drizzle a little of the vinaigrette on the fish, or leave for your guest to serve as they wish. 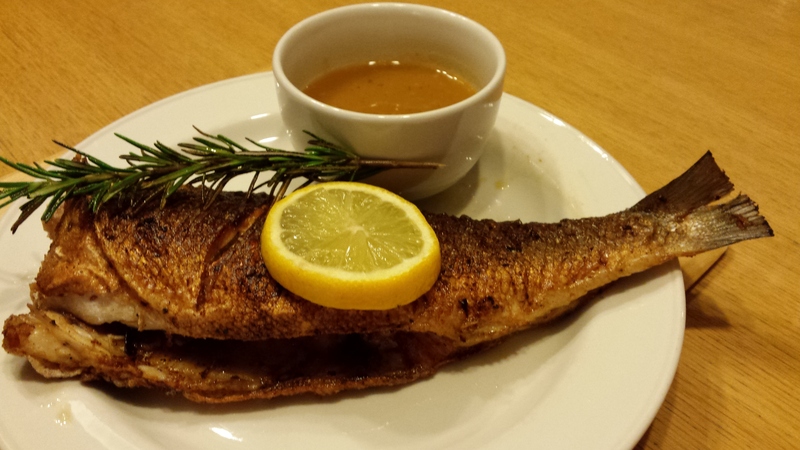 Brinda’s Note & Serving Suggestions: A whole fish always looks impressive as a centrepiece on a dinner table. I like to serve my fried fish with an aromatic saffron and fried onion flavoured rice. The fish can be served with several accompaniments such as a beef tomato salad, aromatic saffron rice, fresh bread, the choice is yours to explore.